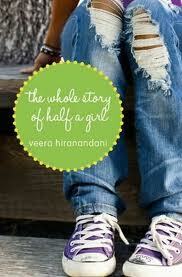 The Whole Story of Half A Girl is a quick, fun read, certain to please middle grade readers. Check out Veera Hiranandani’s website here. “I don’t know if we even count as a real Jewish family any more than we count as an Indian one” (13). “Every time I say my last name for the first time, people always ask me to say it again or spell it three times, and they still can’t get it right” (33). “I ate my sandwich and tried not to think of Community. Or why the white kids and black kids didn’t sit together here. Or where you were supposed to sit if you were too dark to be white and too light to be black” (43). “For everything that reminds me of who I am, there’s always something reminding me of who I’m not” (84).